Careful statistics: Researchers will need thousands more sequences before they can tie noncoding regions to autism. The number of top autism genes has risen from 65 to 99, based on an analysis of nearly 35,000 sequences. And researchers are seeing the first hints of autism risk variants in the regions between genes. The new findings are the payoff from increasingly sophisticated analyses of a growing number of sequences from people with autism and their families. Researchers presented the unpublished results today at the 2018 International Society for Autism Research annual meeting in Rotterdam, the Netherlands. “Large-scale collaborations which integrate data have the potential to give context to the results we’re seeing,” says co-lead investigator Stephan Sanders, assistant professor of psychiatry at the University of California, San Francisco. For their new work, the team added 20,000 sequences. This alone raised the number of genes from 65 to 79, says Brooke Sheppard, a postdoctoral associate in Sanders’ lab who presented the findings. The team then applied an updated version of their statistical method, called TADA, which indicates whether a variant in a gene is likely to be harmful. The statistics reboot raised the number of significant genes to 99. It also boosted the significance of many genes previously included in the list of 65. For example, FOXP1 is now a leading autism gene and SYNGAP1 is nearly as significant as the top two contenders, CHD8 and SCN2A. Just building a list of genes will not be enough to understand autism, however, says Thomas Bourgeron, professor of genetics at the Institut Pasteur in Paris, who was not involved in the study. Researchers from various disciplines need to work together to tease apart all aspects of the condition, he says. Sanders says he plans to make the list of genes freely available prior to publication, so that scientists can work together to understand how the candidates contribute to autism. Another study presented at the same session explored risk variants in the 99 percent of the genome that does not code for genes. The researchers found evidence that variants in so-called ‘noncoding regions’ may increase autism risk. 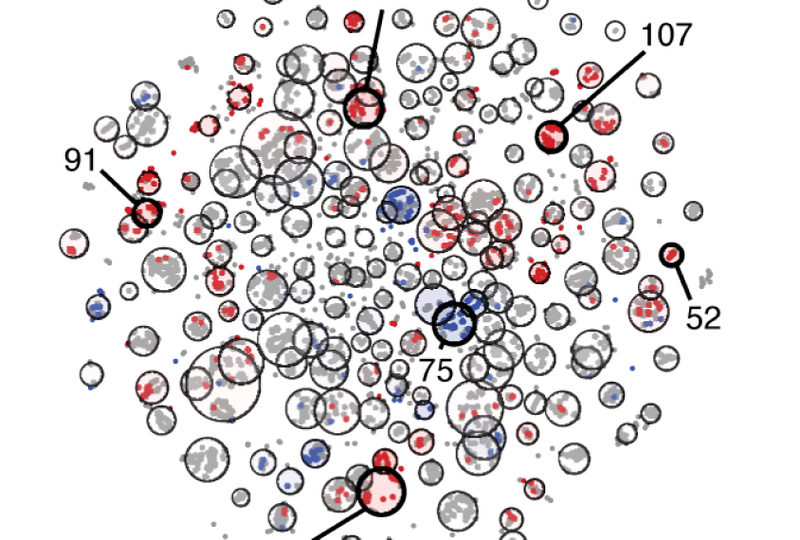 Sanders and his colleagues first looked at noncoding regions in 2,076 whole genomes. They used a stringent statistical method that corrects for chance findings and did not tie variants in any type of noncoding region to autism. They reported those findings 26 April in Nature Genetics. They then repeated this analysis with more than 7,000 whole genomes. This number is still too low to link any one type of noncoding region to autism with statistical significance, according to Joon An, a postdoctoral associate in Sanders’ lab who presented the results. The team then tried a different approach: They applied a machine-learning method to the first set of sequences to determine what aspects of the genome predict whether someone has autism. They then tested this prediction on another 5,532 sequences. This analysis suggests that people with autism carry an excess of variants in regions that extend 1,500 base pairs before genes and control the genes’ expression, if those regions are also conserved during evolution. Researchers may need more than 24,000 whole genomes to pinpoint the most relevant noncoding regions, Sanders says. And they will need thousands more before they should even attempt to identify individual variants in those regions.